A number of weather warnings are in effect as heavy rain and strong winds are expected across much of the country. A status yellow wind warning is in place for Leinster, Connacht, Munster, Cavan, Monaghan and Donegal. 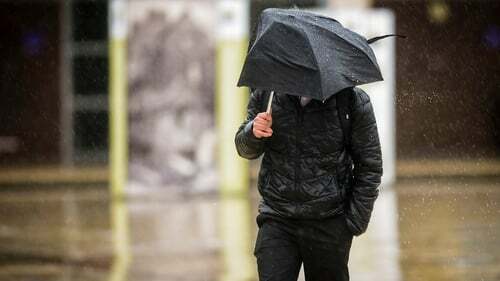 Met Éireann says southeasterly winds will reach average speeds of 50-65km/h with gusts of 90-110km/hr. The forecaster said gusts would exceed these values in exposed coastal areas and on higher ground, especially in the southeast. The warning will remain in place until 3pm for Connacht and Munster and 7pm for Leinster, Cavan, Monaghan and Donegal. A status yellow rainfall warning for Dublin, Carlow, Kildare, Kilkenny, Louth, Wexford, Wicklow, Galway, Mayo, Cork, Kerry, Tipperary and Waterford will be in place until 6pm. Heavy rain is expected to lead to accumulations of around 25-40mm. The Met Office also has a status yellow rain and wind warning in place for Antrim, Armagh, Derry, Down, Fermanagh and Tyrone. The warning for Northern Ireland will be in place until midnight, with heavy rain and strong winds expected.